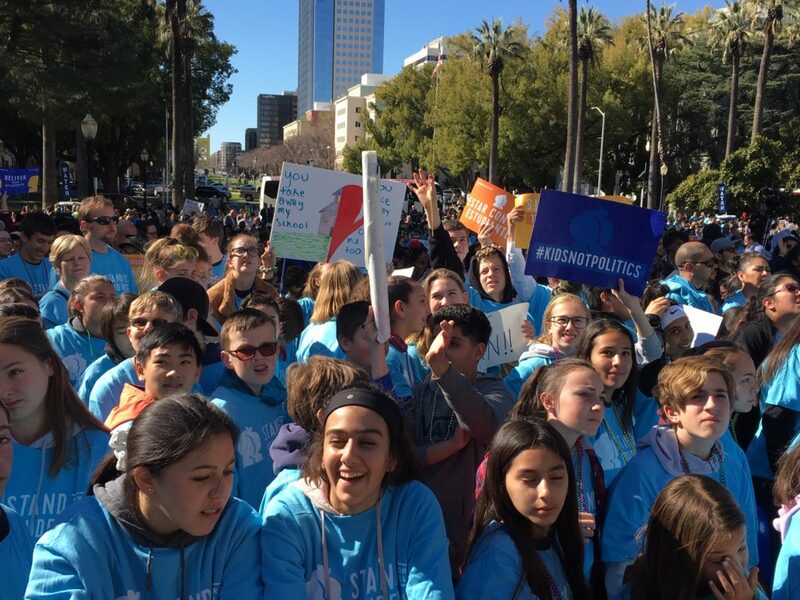 Students from charter schools throughout the state protest pending legislation in Sacramento limiting the growth of charter schools. Assembly Bill 1505 would remove the ability of the State Board of Education to approve a charter application after it had been denied by a local school district or a county office of education. AB 1505 would also allow districts to consider the possible negative financial impact of a charter school on a district when deciding whether to grant a charter. Assembly Bill 1507 would prohibit charter schools from opening additional schools outside the district where they received their original charter. The bills, which would make significant changes to California’s charter school bill — adopted in 1992 and revised several years later — were approved after five hours of debate and public testimony. Advocates on both sides of the issues held events in Sacramento yesterday and packed the hearing room where the bills were discussed. Leading charter school advocates fear that, if passed, these bills would could halt charter school growth in the state, or even threaten the existence of the entire sector. The Education Committee includes several lawmakers who have worked in schools or with children and youth programs. They clearly believe that reform of California’s charter school sector, which serves over 600,000 children in over 1,300 schools, is necessary. The committee chairman is Assemblyman Patrick O’Donnell, D-Long Beach, a former high school teacher. Others on the committee include Assemblyman Kevin McCarty, D-Sacramento, who worked with early childhood and youth programs before he was elected to the Assembly. The bills must still navigate a legislative maze before they are approved. Both chambers must still consider them and Gov. Gavin Newsom would have to sign them if and when they reach his desk. He has so far given no indication on where he stands on the restrictions the bills call for. Newsom then asked State Superintendent of Public Instruction Tony Thurmond to convene a task force to make recommendations on some of the same issues the bills voted on yesterday are intended to address. The 11-person task force is operating on a parallel track while the bills move forward in the Legislature. The task force, which is shooting to issue its recommendations by July 1, is meeting today in Sacramento for the fifth time. However, its meetings are not open to the public. There has to be something obviously wrong when a teachers’ union is opposed to schools that are only in existence because some need was not being met in the traditional districts. The whole point is political power and not the students. Most charters are not unionized and that is why the union has a problem with them, nothing else. The more teachers teaching at charters the less power the union has, period. Perhaps districts would be better served figuring out how to meet the needs that resulted in the charters coming into existence in the first place. The Education Force returns. Why are we not surprised? Great charter schools – such as that of my grandchildren – must go. And, according to the teacher union, “for the children”. I have to debunk a line of charter-sector propaganda that has been around since Edison Schools was the magical miracle fad o’the day in 2001 and should have been challenged or at least ignored by every journalist then and since. That’s the notion that school board members oppose charter school because they’re “jealous” or don’t want “competition.” This makes no sense. OK: Say you’re a righteous, ethical, selfless school board member who cares only about the well-being and academic success of the children in your district’s schools, and a charter school is proposed, and you have every reason to believe it will be a success. Obviously, you support it, right? Now, say you’re a conniving, scheming, utterly self-serving school board member who cares not a bit about the well-being and academic success of the children in your district, but cares only for your own self-serving political future. You see a charter proposed for your district and have every reason to believe it will be a big success. Obviously you leap to support the charter, tout your support for it, and claim credit for it when it proves to be a big success, right? So who exactly is the school board member who opposes a wonderful magical miracle charter that promises to bring great success to your district? This. Makes. No. Sense. All press should challenge this ridiculous notion. I absolutely agree with CarolineSF. People who are opposing are people who want to make sure our communities don’t have access to quality education. These people don’t want competition, don’t want change in a system that will result in good for our students. As a parent and sister of student, we saw the failure of large district operated schools personally. It is enough! You completely missed her argument. They come out in favor of charter schools because there are working-class parents that see the charter school as the only alternative to a hellhole school. Those parents would hold them accountable if they didn’t. Anyway the school board is not the teachers union. Try again.